Timing: the ignored factor in training and performance: chronotyping and chronotraining. | Helping the best to get better! Timing: the ignored factor in training and performance: chronotyping and chronotraining. We always assumed that in taking medication it would not matter when you take the pill: morning, afternoon or evening. But science proved us wrong: chronopharmacology is a relative new branch of science in which the timing of application of a medication is studied. Chronopharmacology is a new branch at the tree of chronobiology, the study of the rhythms in biology. An even newer branch is chrononutrition, which basically studies what the optimal timing is for food or nutritional supplements. But why is there no chronotraining which would research the effects of different times of training in relation to the adaptation to training. In other words, it would answer the question: does it matter when I train? And probably to quite a large extent. This might not be interesting for the recreational athlete, but for the elite athlete it is, In the end it might make a huge difference in efficiency of training, progress and performance. Since the elite athlete should be looking for that very small margin making the difference between winning and losing, between success and failure, between gold and silver. One simple factor might already help us here: it’s called chronotyping. Are you a morning-type or an evening-type, a lark or an owl? Do you wake up fresh and sparkling, full of energy and wanting to train before breakfast? Or do you need time to wake up, warm-up and preferably train late in the afternoon. And of course there are people to whom it does not make a difference when they feel best, no extreme morning- or evening-types. A simple guideline from experience and theory: train when you feel best. The exception to this rule is when you are preparing from a tournament or for competitions at a certain given time. It would not be smart to always train in the evening while all of a sudden you have to go through qualification rounds in the morning or always train in the morning while your competition is late in the evening. You might have trouble adapting in time to perform at your best at a time that your body and mind aren’t used to. I used to coach an elite female athlete who was an extreme morning-type, waking up in the morning and ready to go! And during day time you could sense and measure her energy slowly disappearing. At the other hand, in the same period I used to coach an Italian athlete who was rather an evening type: waking up late, go for a late and small breakfast: coffee and a roll, then relax, wait for lunch, relax and train in the late afternoon, seeming to gain more energy as the day progressed. Since I believed in chronotyping, I coached them at separate times of the day. The first mentioned in the morning and the second one in the evening. It made my working days longer, but it was worth it! Implementation of this is not always as easy as shown above. First of all many coaches deal with teams and we can’t just train every player at a different time. Secondly, we also depend on the availability of the facilities, suppose you’re a morning-type but the weight room is only available in the afternoon. But still those who coach individual athletes have to think about chronotyping since a lot of effort and money is spent on increasing the small improvements, like equipment, nutrition, training methods, etc. Training at the right time of the day, for that athlete might be even more efficient. It’s not only the time of the day, but also the week of the month, think about the menstrual cycle of female athletes,. And also the months of the year, since adaptation to training is different in summer and winter, probably due to the effect of sunlight and the impact on the hormonal systems. There are even shorter cycles like ultradian cycles, e.g. 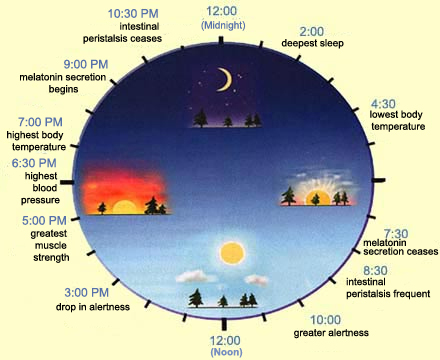 the BRAC or Basic-Rest-Activity-Cycle of approximately 90-120 minutes. It’s probably something we are all unconsciously familiar with e.g. in case of attention span in students or the duration of a workout. Now how do you know the chronotype of an athlete? In the past a lot of research has been done on the influence of time on mental and physical performance e.g. in case of shift work, sleep deprivation and jet-lag in industrial or military setting. Also in Russia and the former GDR sport scientists have spend time to look at this, but in the West this factor seems to be ignored. Oschutz, H: Chronobiologie im Sport; Leistungssport, No.4,1991, pg.12-15. Adam, K; Tomeny, M; Oswald, I: Physiological and psychological differences between good and poor sleepers; J.Psychosom.Res. Vol.20, No.4, 1986, pg.301-316. 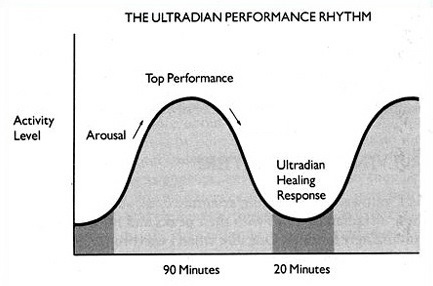 Klein, R; Armitage, R: Rhythms in human performance: 1.5 hour oscillations in cognitive style; Science, Vol.204, June 22 1979, pg.1326-1328. Kleitman, N: Basic rest-activity cycle 22 years later; Sleep,Vol.5, No.4, 1982, pg. 311-317. 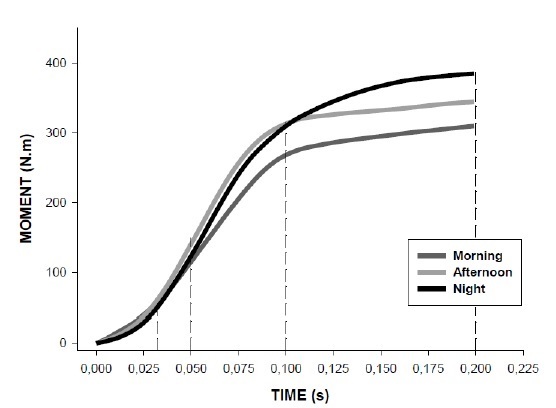 Hill, D.W; Cureton, K.J; Collins, M.A; Grisham, CS.C: Diurnal variations in responses to exercise of “morning types” and “evening types”; J.Sports Med.Phys.Fitness Vol 28, No.3, 1988, pg.213-219. Hommel, H.H; Luck, P: Chronobiologische Grundlagen und ihre Bedeutung fuer die Sportmedizin; Med.und Sport Vol.25, No.8,1986, pg.239-242. Hecht, K; Poppei, M: Chronomedizinsche Aspekte der psycho-nervalen und physischen Leistungsfaehigkeit; Med.und Sport. No.12, 1977, pg. 377-386. Hildebrandt, G: Chronobiologie in der Medizin; Arztezeitschr. Naturheilverf. Vol.26, No.3, March 1985, pg. 135-152. Winget, C.M; DeRoshia, C.W; Holley, D.C: Circadian rhythms and athletic performance; Med.Sci.Sports Exerc. Vol.17, No.5, 1985, pg. 498-516. Patterns of Human Chronotypes; J. Biol.Rhythms, Vol. 18 No. 1, February 2003, 80-90. Tamm, A.S; Lagerquist, O; Ley, A.L; Collins, D.F: Chronotype Influences Diurnal Variations in the Excitability of the Human Motor Cortex and the Ability to Generate Torque during a Maximum Voluntary Contraction; J.Biol.Rhytms, Vol.24, No.3, 2009, pg.211-224. Teo, W; Newton, M.J; McGuigan, M.R: Circadian rhythms in exercise performance: Implications for hormonal and muscular adaptation; J.Sports Sci.Med. No.10, 2011, pg.600-606. Postolache, T.(Ed. ): Sports Chronobiology; Elsevier Clin. in Sports Med. Drust, B; Waterhouse, J; Atkinson, G; Edwards, B; Reilly, T: Circadian rhythms in sports performance- an update; Chronobiol.Int., Vol.22, No.1, 2005, pg.21-44. Shibata, S; Tahara, Y: Circadian rhythm and exercise; J Phys Fitness Sports Med, Vol.3, No.1, 2014, 65-72. Cappaert, T.A: Review: Time of Day Effect on Athletic Performance: An Update; J.Strength Cond.Res. Vol.13, No.4, 1999, pg.412–421. Di Cagno, A; Battaglia, C; Giombani, A; Piazza, M; Fiorilli, M; Calcagno, G; Pigozzi, F; Borrione, P: Time of Day – Effects on Motor Coordination and Reactive Strength in Elite Athletes and Untrained Adolescents; J.Sports Sci. Med. No. 12, 2013, pg. 182-189. Reilly, T; Waterhouse, J: Sports performance: is there evidence that the body clock plays a role? Eur.J. Appl.Phsyiol.Vol.106, 2009, pg.321-332. Carandente, F; Montaruli, A; Roveda, E; Calogiuri, G; Michielon, G; La Torre, A: Morning or evening training: effect on heart rate circadian rhythm; Sport Sci. Health, 1, 2006, pg. 113–117. Pereira, R; Machado, M; Ribeiro, W; Russo, A.K; de Paula, A; Lazo-Osorio, R.A: Variation of explosive force at different times of the day; Biol.Sport. Vol.28, No.1, 2011, pg.3-9. 2 Responses to Timing: the ignored factor in training and performance: chronotyping and chronotraining. In chronobiology hormonal release is also a big issue. The hormonal release during the day of testosterone is different . This also may affect your training result. What is your opinion in this? Greetings Ron Beurskens, sportfysiotherapeut en fysiek trainer. Hello Ron, interesting in practical sense, at least one would think ….. Testosterone (T) plays an important role, no denial of that, but there are many other factors with a much larger impact on T level like: gender (obviously), age, intensity and volume of training load, etc. The circadian variability of T is rather small, compared to those of other important hormones like e.g. cortisol, insulin and growth hormone, which may also influence training responses. And than the other factors like mTOR, AMPK, etc. what is their role in chronobiological sense? Yes, it makes it all complex for simple coaches like us, but at same same time more challenging as well 😉 I would not focus in T only. Here is my question: why are men only 10% stronger than women and is our muscle strength/muscle diameter even the same like in women, while our T level is 10 times higher than in women?